Segment.com customers can easily gather feedback at different customer journey points with our native Segment integration. Sending surveys after touchpoints in the customer lifecycle gives you the opportunity to gain insight into the entire customer experience. This feature is available to Wootric customers on our Pro Plan or higher. Contact Wootric support for more information. Note: Enabling this integration will override and replace all other survey settings in the account. 1. 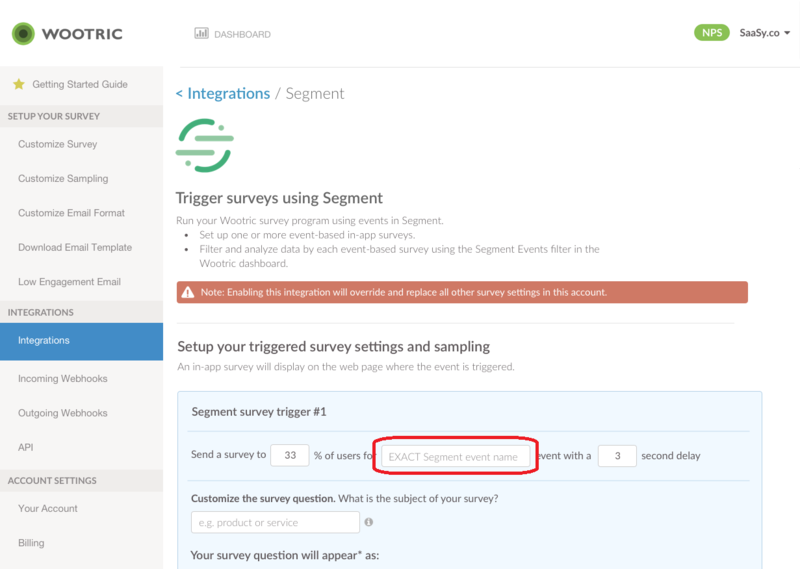 To set up an in-app survey based on a Segment event, navigate to your Wootric account settings. 2. Select “Integrations” in the sidebar, and then click on “Set Up” next to the Segment integration. 3. In Segment, copy the exact name of the event that you wish to trigger a survey. Paste that into the “event name” section in Wootric. 4. Choose the % of users who complete this event that will be surveyed. If you use the default setting of 33%, this means that each user who completes the specified event has a 1 in 3 chance of being surveyed. 5. Choose how many seconds of delay between event completion and seeing the survey you wish to have. The default setting of 3 seconds means that once a customer has completed an event and is chosen to be surveyed, Wootric will wait 3 seconds before the survey appears on the webpage. 7. To control how often customers are eligible to be surveyed, expand the section called “Survey Throttle Settings”. Here, you can control how many days Wootric will wait before a customer has a chance of seeing a survey again, depending on the action they take when they first see a survey. If the customer responds to the survey, they will be subject to the first eligibility rule. If the customer declines, they will be subject to the second eligibility rule. 8. Hit “Save” when you are finished. Please note again that hitting save will override any other survey settings for the account you are working in. The survey you have just set up will appear on the web page where the event triggers.